As a tradesperson, how do you protect your hand muscles from strain or injury? Alan Rankin, Head of the Industrial Tools Team at Bahco UK and Ireland, offers some sound advice. A recent Health & Safety Executive (HSE) report has found that musculoskeletal disorders (MSDs) ‘make 80,000 UK trade workers ill each year’, which can have a detrimental impact on plumbers and installers. According to the Executive, MSDs are by far the biggest cause of injury and illness affecting workers in skilled trades, especially in the construction and building industry. There are, in fact, twice as many work-related MSDs in this business sector than in other, less hazardous occupations. On average, MSDs and stress account for eight out of 10 work-related health conditions in the construction sector. Hand and arm muscle strains and injuries are among the conditions most frequently encountered by professional trades. These are not only painful, but can lead to lost working time or, for the self employed, lost business. This is perhaps unsurprising when you consider that just gripping a hand tool can activate up to 42 different hand muscles. Eventually this can cause strain, pain or numbness in the hand, wrist or arm. Constant, often unavoidable repetition of specific actions are more likely to cause injury, even if they don’t feel all that strenuous at the time. Hand tools which are the wrong size to fit your hand can also increase the risk of Repetitive Strain Injury (RSI) or similar muscular conditions. Using ergonomic, well balanced hand tools can be the key to reducing muscular stress in the hands, arms and wrist, providing greater comfort, cutting vibration and helping to avoid blisters, calluses and pressure points. 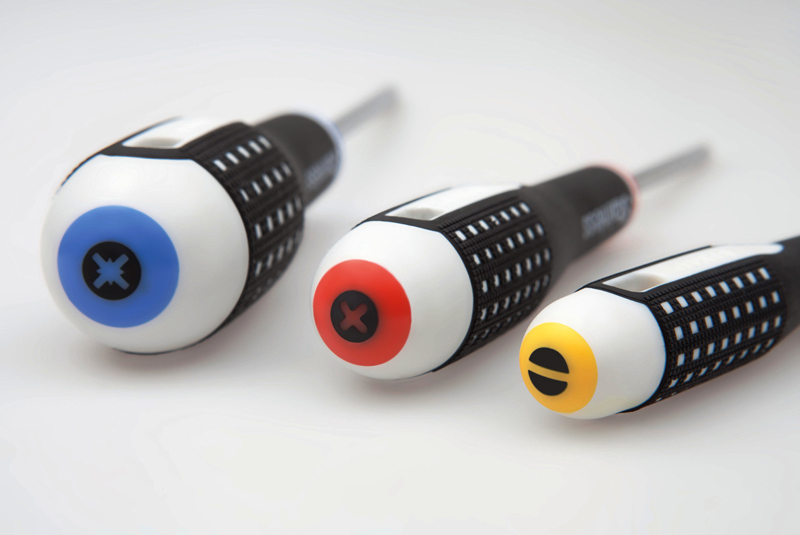 Ergonomic tools are not new; designers at Bahco produced the company’s first ergonomic tool, a screwdriver, more than 30 years ago. There are now more than 550 ergonomic tool types available in the Bahco range today. To avoid unnatural hand positions, choose tools with a handle long enough to distribute pressure evenly over the palm, eliminating pressure points which could cause a callus. Spring loaded pliers are good, provided you can lock them or have a spring with an on/off function. Check that a tool allows you ‘precision grip,’ allowing small movements with your index finger and thumb, or ‘force grip,’ such as holding a hammer in your palm, or both. If you’re buying a large screwdriver, look for one designed to optimise the torque transmitted. When using pliers, bear in mind that the longer the shank, the lower the cutting force you will need. Also, the closer the rivet is to the cutting edge the greater the cutting force. Keep your hands warm as much as you can. Winter temperatures anaesthetise the hands and conceal pain. Cold hands lose sensitivity and are more easily damaged by cuts and scratches. Ice hardening technology, used by NASA and other space agencies to develop rocket fuel, is now being used by production engineers at Bahco to manufacture a range of stainless steel hand tools and storage trolleys. Stainless steel, hard enough for trade and industrial work, has previously been too brittle to use. Bahco believes it has overcome this problem by using cryogenic techniques to give its stainless steel tools improved hardness and durability. Using a conventional ferrous steel screwdriver or pliers can leave traces of ‘foreign object’ debris on screws and other fasteners, causing them to oxidise and create extraneous rust. Stainless steel, on the other hand, is renowned for its hygienic qualities and ease of cleaning, as well as its resistance to all weather conditions, corrosion and antacids. Bahco believes that stainless steel hand tools will reduce contractors’ costs by reducing the need and frequency to replace worn tools. Alongside this, the introduction is timely, with demand for stainless steel screws and other fixings having risen by almost 70% over the past few years. The new range includes adjustable wrenches, double ring end offset wrenches and combination wrench sets, six plier types – box joint, combination, cutting, locking, long nose and slip nose – plus ball pein and sledgehammers. Slotted, Phillips, Pozidriv or Torx screwdrivers and bits remain available in a range of sizes, along with hex sockets, ratchets, extensions, speed and ‘T’ handles.